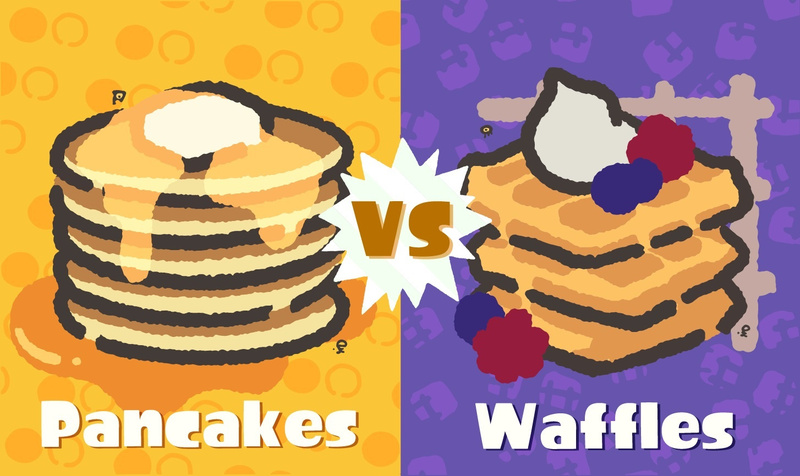 If you're still participating in the Splatoon 2 Splatfests on a regular basis, you'll no doubt have heard this weekend's battle in Europe and North America was all about pancakes and waffles. That's because waffles actually are better IMO. 0-3? You're kidding right? Damn I was CERTAIN Pancakes were going to at least win the popular vote. Waffles are overrated. Of course, the one time I don't play, and the team that I would have voted for goes and wins. Ever since the new clout system, I have lost every SplatFest. Before that, I was winning every one because I could predict which one would be the popular vote. @CurryPowderKeg79 dont be that one guy man pancakes are actually good too. "The sweet taste of victory"
Too soon, man. Don't you know SpongeBob fans are still grieving over the Super Bowl halftime show? Good job Waffles! Was a good run! Another Splatfest win in the pocket. Nice win. For the first time ever, I won a 10x match. I had a bunch of waffle vs waffle matches and got stomped on those. Team Waffle was going all out, even in the matches that don't count. Like usual, there was some excellent artwork for both sides. That is always good to see. @Not_Soos It’s a slow recovering process. We aren’t there yet, but soon we may be able to once again say The Game That Shall Not Be Named. @Gen0neD Haha, I wish it was that easy predicting who'd win! 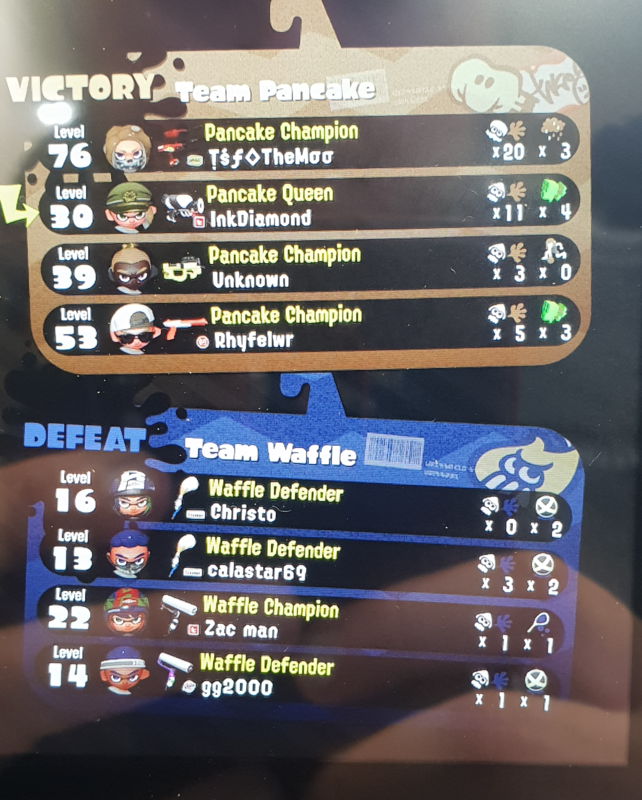 I was on team Pancakes and barely lost a match.. won one of them with 84% of the turf to 7%. @Matthew010 Oddly enough, in real life it's always the waffles that are battered. @SMW Its a great feeling isn't it, I managed to bag a screenshot of my team on the Splatfest screen outside the lobby. I like pancakes too @PrincessBowsette but love syrup witch is why i like waffles with their pockets for syrup the best. Tis a great weekend. Ma boi Waluigi FINALLY gets his Valentine Day recognition, and the waffles have beaten the pancakes fair and square. Can't say I'm a fan of either in the context given so just randomly picked a team. Pancakes shall have their revenge one day! @CurryPowderKeg79 That's, like, your opinion, man. @Shiryu with pulp or without? 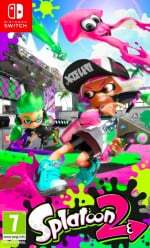 Why am I always on losing team..
@BigMac1204 That's next month's Splatfest. Today Ain’t your day, Pancakes. Man, I wish there were Waffle Houses up in the Northeast US so I can go celebrate! But wow, now we're on Marina's first 3-win streak! 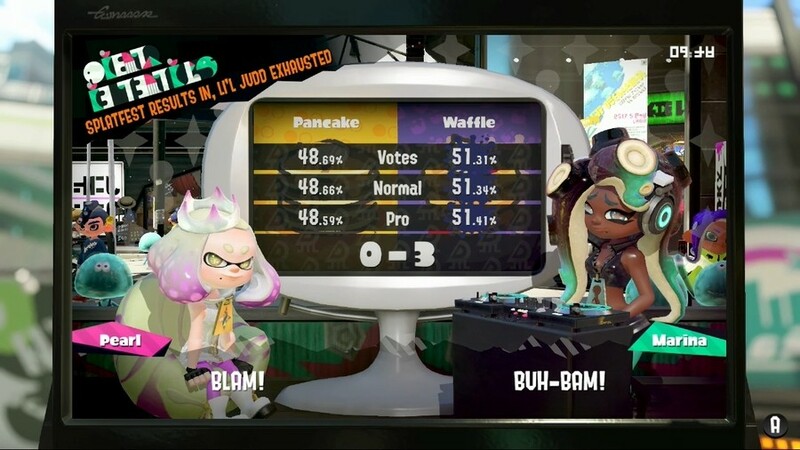 Well played, Team Marina! As of now, in NA it's Pearl-11 to Marina-10 (or tied 11-11 if we include the Splatfest Premiere...which I do) with at least 5 more Splatfests left. I say at least just in case there's another tournament-style one later. Things are really heating up! I celebrated the imminent win of waffles this morning by making some delicious waffles. ‘Twas a sweet victory. Waffle for the win. Times like this I have to remind myself to get a waffle iron (maybe that Pokeball one) instead of frozen waffles. I was waffles. We faced some tough Pancakes, but towards the afternoon it seemed Pancake was made up of newer players. We also played a bunch of waffle v waffle matches. Good splatfest! No communication errors. Oh well, must say sorry to team pancakes, feel I played terribly. If I were to have participated, I would have picked waffles because I like Marina more, but y'all are trippin if you think waffles are better than pancakes. I don't even know you people. If you chose waffles, then you have not experienced correctly executed pancake perfection. YES! My daughter and I played together on Saturday and we picked Waffles! waffles are corrugated for extra real estate to add on toppings. Whipped cream, butter, fruit, jam, syrup! Pancakes are flat and boring. Haven't won any splatfest yet in the last 2 ones. I guess I've to choose the Marina side next time, no matter what choice is.